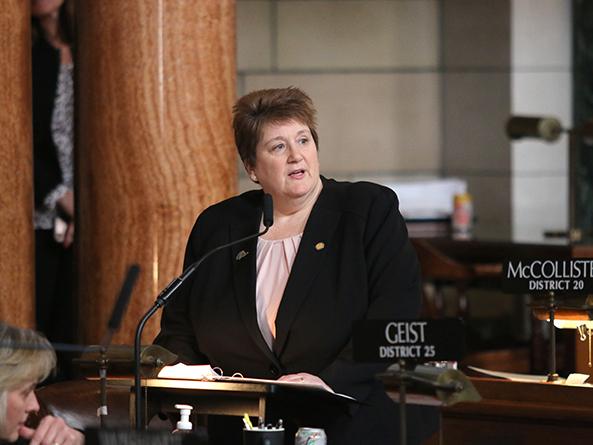 Senators debated a bill on general file Feb. 20 that would require the Legislature to regularly review Nebraska’s occupational licensing laws. As introduced by Sen. Laura Ebke of Crete, LB299 would create a legislative office responsible for reviewing proposed legislation that would enact or modify occupational licensing regulations to ensure that they are the least restrictive means of achieving the regulation’s ends. It also would require ongoing legislative review of occupational regulations and legislation. Fifty years ago, Ebke said, only 5 percent of occupations required a license, compared to 25 percent today. It makes sense to require a license if it improves public health and safety, she said, but in other cases the Legislature should allow market-based competition to weed out bad practitioners. LB299 would not alter any current licensing requirements, Ebke added, and any changes to those requirements would have to go through the regular Legislative process. The bill also would accelerate the process by which those with criminal histories could determine whether their conviction would disqualify them from obtaining an occupational license, Ebke said. “This is a bill that could help us chip away at recidivism in our prisons and stop the return-to-prison pipeline by increasing the opportunities for success for those who are being released,” she said. A pending Government, Military and Veterans Affairs Committee amendment would require legislative committee staff to evaluate the effects of proposed legislation on occupational licensing, compare it with policies enacted in other states and to issue a report on that legislation to the relevant committee. Staff could request that proponents of legislation that would enact or modify occupational regulations to submit evidence of present, significant and substantiated harm to Nebraska consumers. Each standing committee also would be required to review and analyze one-fifth of the occupational regulations under the committee’s jurisdiction every five years. A person with a criminal conviction could petition an occupational board at any time for a determination as to whether the person’s conviction would disqualify him or her from obtaining a license. A person’s criminal history would be disqualifying only upon a felony conviction if it is listed as a disqualifying offense in the law governing the occupational regulation or if the board concludes that public safety outweighs the person’s right to pursue an occupation. The board would be required to make its determination within 90 days of receiving a petition and could charge no more than $100 for each petition. 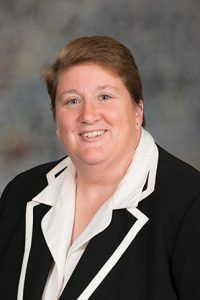 Sen. Sue Crawford of Bellevue agreed that the Legislature should periodically review its occupational licensing laws to remove barriers to employment. However, she filed an amendment that would exclude the approximately 100 health professions currently covered by the state Department of Health and Human Services’ credentialing review program—also called the 407 process—from most of the committee amendment’s provisions. Crawford said neither the department nor the Health and Human Services Committee have the staff necessary to conduct the number of occupational licensing reviews that would be required under Ebke’s proposal. “I don’t think it’s doable for our committee to review this many professions every five years,” she said. The Crawford amendment failed on a 24-10 vote. The Legislature adjourned for the day before voting on the committee amendment or the bill.